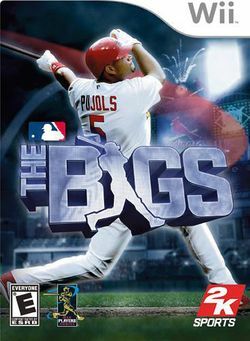 The Bigs (stylized as The BIGS) is an arcade-style baseball video game that has been released for the PlayStation 3, Xbox 360, Wii, PlayStation 2, and PlayStation Portable. It was released on June 25, 2007 in the United States on all formats. The game was also released in Europe exclusively on Wii on October 26, 2007. A sequel, The Bigs 2, is scheduled for a summer 2009 release, as announced on the 2K Sports-produced MLB 2K9. The game focuses on stylistic rather than realistic design, and gameplay featuring power-ups and turbo. It has also given the game of baseball a more "street" feel to it. The game features online play capability for up to four players on most of the seventh generation consoles, though online play is not compatible on the Wii. The St. Louis Cardinals' first baseman, Albert Pujols, is on the cover. Minnesota Twins first baseman and former MVP Justin Morneau is featured on the cover of limited edition Canadian version sold exclusively by Future Shop and Best Buy. Radio host Damon Bruce provides play-by-play commentary. This page was last edited on 20 May 2009, at 15:39. This page has been accessed 6,230 times.